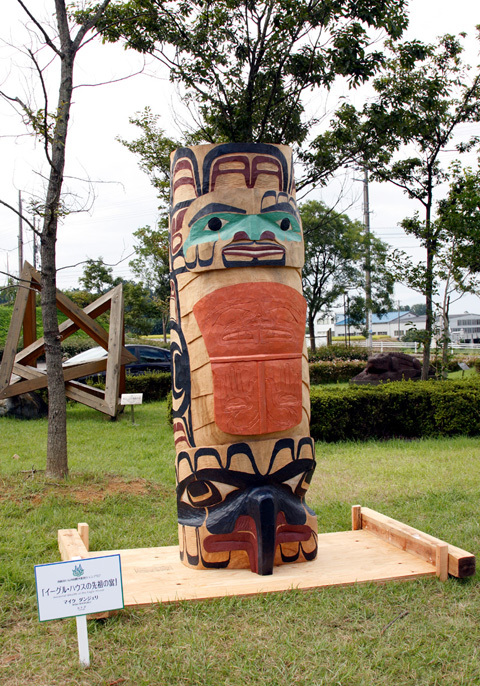 This type of totem pole is called a house post because of its placement against the post that held up the beams of our long houses. This host post represents my family's history. I am of the eagle clan of the Nisga'a Nation. The eagle on this house post is shown diving with his head at the bottom of the post, wings swooping back at it sides, and the tail above. Between the wings of the eagle is copper shield which is the highest form of ceremonial wealth in our culture. On the copper shield is my family's crest the beaver. I have carved a self-portrait in the eagle's tail to leave a bit of myself in Inami as my wife and I love the people of Inami and hope to return someday.